This is a rare Tudor/Renaissance silver posy holder, dating to the 16th century. It is expertly crafted from silver sheet into a funnel/trumpet shape. 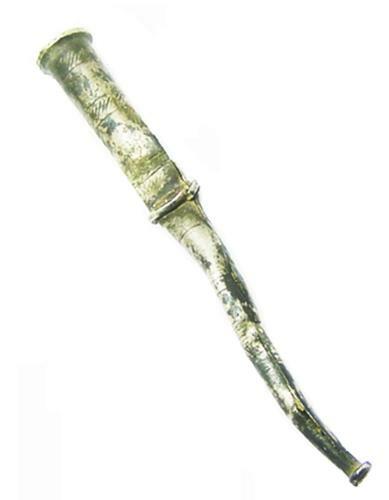 Such objects were used to hold flowers or feathers, attached to a hat or secured to the hair with a bodkin. These are scarce objects, mostly worn at court or in enclosed gardens of stately homes, as such are seldom found. This example appears intact although a little bit crumpled.